A Stand Up Paddle Board deserves to be protected when in transport and storage. Not only does a Stand Up Paddle Board bag give you peace of mind from a damage point of view, it allows your SUP to be carried easier (most SUP bags will come supplied with multiple carry handles and a heavy duty shoulder strap). The Stand Up Paddle Board bags will also help to prevent your vehicle from becoming wet and sandy from putting your wet SUP straight in to the car/van. 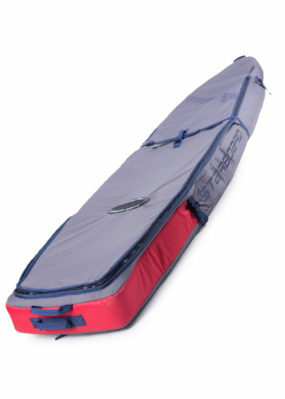 With a range of specifications and price points for our stand up paddle board bags to suit all customers, our range of SUP board bags is more than enough choice for everyone and we are confident we have the right SUP board bag for you. We have makes from the likes of Starboard SUP, Ocean & Earth, Creatures of Leisure and Komunity Project. We also have immediate access to the entire Starboard range of SUP board bags, so we are sure we’ll have the right stand up paddle board bag for your Starboard SUP, but if you don’t have a Starboard SUP, we have in stock a range of standard sized bags with enough width to fit virtually any SUP with fins on (all SUP board bags will come with a fin slot). And finally, just in case all else fails…..If you have a non-standard sized SUP we are able to have custom SUP board bags made, to a specification of your choice, so if this is what you are after make sure you contact us for more information.